A total of 66 militant attacks were registered. Two Ukrainian servicemen were killed and four wounded in combat in Donbas on 16 May, the Joint Forces Operation press centre has said. According to intelligence, five militants were killed and eight wounded.The Russian occupying troops violated a ceasefire 66 times, including by using mortars, artillery and BM-21 Grad multiple launch rocket systems on 25 occasions. At around 9 p.m., they used Grads against the JFO positions near Avdiyivka. In the Luhansk sector, engagements continued near Novozvanivka and Troyitske. Snipers were active there. In the Donetsk sector, the enemy stepped up shooting near Luhanske, Svitlodarsk, Novoluhanske and Mayorsk. Engagements continued in the Avdiyivka industrial zone and near Opytne. 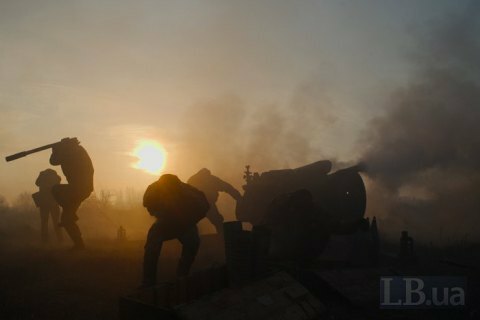 Near Mariupol, the enemy was active near Vodyane, Lebedynske and Shyrokyne. The Ukrainian army has sustained no losses since midnight. One of the fallen Ukrainian servicemen is 20-year-old Zhytomyr resident Dmytro Rud, according to the Zhytomyr city council's post on Facebook. He was killed during an enemy attack near Talakivka, Donetsk Region at around 4.20 p.m. on 16 May. On 15 May, one Ukrainian serviceman was killed and two wounded.